Wind in my face, I take in the view before me. On the left: Valahnúkur, with its vertical sea cliff, and on the right: the white tower of Reykjanesviti, one of Iceland’s oldest light- houses. Off shore, sea stack Karlinn appears as gatekeeper to the wild Atlantic Ocean. Welcome to the Blue Diamond, a true gem of a tourist route, right next to Keflavík International Airport. Perched on Iceland’s southwestern edge, Reykjanes peninsula is the region most tourists first set foot in. Yet it’s quite often overlooked as people quickly move on to Reykjavík and the country’s most famous attractions. 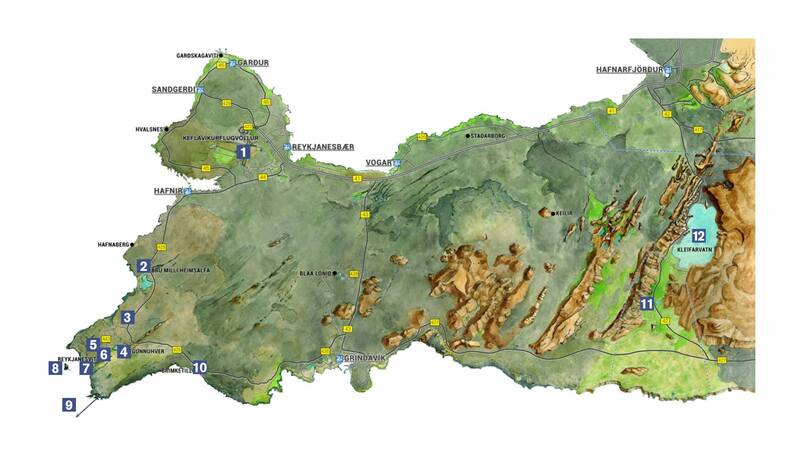 A volcanic wonderland—and in fact a certified UNESCO Geopark—Reykjanes is covered in ancient lava fields. Without the deep fjords and tall mountains as seen in other parts of the country, the landscape seems out of this world. Hidden in the lava are natural wonders and other attractions that can be visited as part of the Blue Diamond tourist route, a brand developed by local pioneers and tourism companies. Designed specially with Stopover passengers in mind, the Blue Diamond can be toured in as little as one hour—perfect for an escape from the airport while waiting for a connecting flight. But there’s plenty to see and experience on longer excursions. At bluediamond.is, travelers can tailor their adventures to their timeframes and personal appetites, then opt for a rental car or a tour bus. You could, for example, check out a few geological gems before a warming lobster soup at a cozy café, then try out the slides at a local swimming pool, followed by a visit to a Viking ship museum. The choice is yours. A string of gemstones not to be missed on the Reykjanes tourist route. 1. Keflavík International Airport – The main gateway to Iceland with about 96% of international traffic. The Blue Diamond tourist route loops from the airport. 2. Bridge Between Continents – Built as a symbol for the connection between Europe and North America, the small footbridge lies across a fissure created by great forces underneath the Earth’s crust that pull the Eurasian and North American tectonic plates apart. 3. Reykjanes Power Plant – With capacity of 100 MW, the plant began generating electricity for the national grid in 2006. The plant uses up to 608°F (320°C) hot steam and brine, extracted from twelve 8,858-ft (2,700-m) boreholes in the area. 4. Gunnuhver – The largest mud geyser in Iceland is named after a 400-year-old poltergeist. The ghost of Gunna wreaked havoc until a priest trapped her in the boiling hot spring. Her spirit still haunts it, so beware! Also, locals used to bake bread in the hot ground here. 5. Stampar – A series of craters created in two eruptions, about 800 and 2,000 years ago. The two craters closest to the road at the north end of the crater row date back to the “Reykjanes Fires” (1210–1240). Walk inside a living volcano and take in the view of the lava fields, or, if you have time to spare, follow the signposted “Hundred Crater Trail” into the lava. 6. Reykjanes Lighthouse – One of Iceland’s oldest lighthouses stands stately on Bæjarfell; its light signal at 226 ft (69 m) above sea level. Its predecessor— constructed on Valahnúkur in 1878—was the country’s first; the lighting equipment a gift from Frederick VIII of Denmark. His visit in 1906 is considered to mark the start of tourism in Iceland. 7. Valahnúkur – Formed in a single eruption when 2,192°F (1,200°C) hot lava rapidly cooled down in the cold sea, Valahnúkur is an easy hike, offering splendid views across Reykjanes and the Atlantic. The beach next to it is filled with boulders tossed ashore by wild waves. 8. Karlinn – “The Man” is a 164-ft (50-m) high crater tap that stands majestically in the ocean off the beach by Valahnúkur. There used to be a “Kerlingin” (“The Woman”), but she washed away into the ocean a long time ago and the poor widower has been alone since. 9. Eldey – About 9.6 miles (15 km) off shore, “Fire Island”—one of the world’s largest gannet colonies—rises 253 ft (77 m) out of the sea. Eldey used to be home to the now extinct great auks. By Valahnúkur, a lone statue of the big flightless bird stands facing the island. 10. 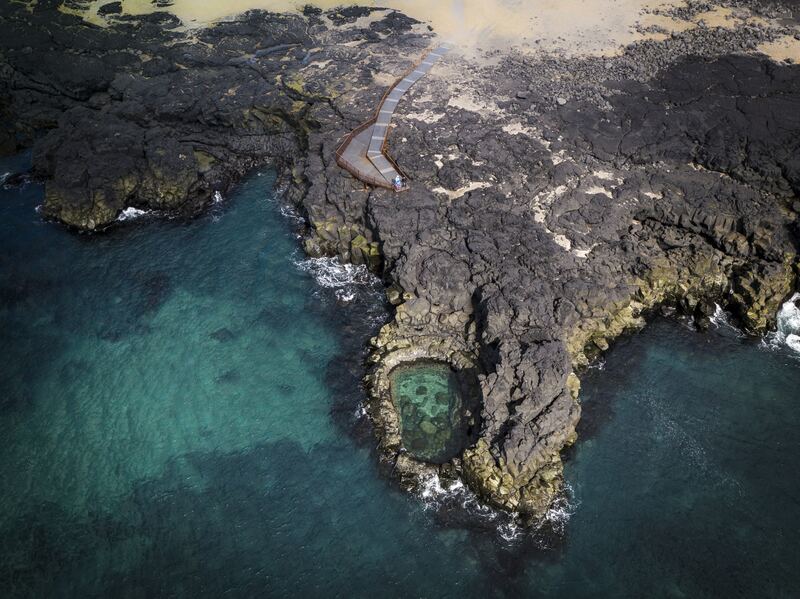 Brimketill – The small pool, naturally carved by marine erosion, can be viewed from a platform near Gunnuhver. The powerful surf is mesmerizing but equally dangerous, so keep a safe distance. The only one allowed to bathe in the pool is a giantess named Oddný. 11. Seltún – The high-temperature geothermal area that features a variety of hot springs: bubbling mud pots, simmering streams and steaming fumaroles. The multicolor ground surprises with shades from pale yellow to bright red, and turquoise to dark green. 12. Kleifarvatn – The largest lake on Reykjanes is at 318 ft (97 m) one of the deepest in Iceland and, according to legend, home to a whale-shaped monster! Due to earthquakes, water is slowly draining from the lake—it featured in a 2004 crime novel by Arnaldur Indriðason. Begin your explorations of the Blue Diamond route from Icelandair's home base, Keflavík International Airport. Traveling between North America and Europe, you have the opportunity to add a stopover in Iceland at no additional airfare. Photos by Ozzo. Banner photo: Reykjanes Lighthouse, Valahnúkur and Karlinn. Bottom photo: Brimketill.